MONTRÉAL, QUÉBEC--(Marketwire - Jan. 8, 2011) - During a special event held at its manufacturing facility in Saint-Laurent, Québec, Bombardier Aerospace today hosted the official kick-off of the 2011 FIRST Robotics competition in Québec and launched the 25th anniversary celebrations of its entry into the aerospace industry. 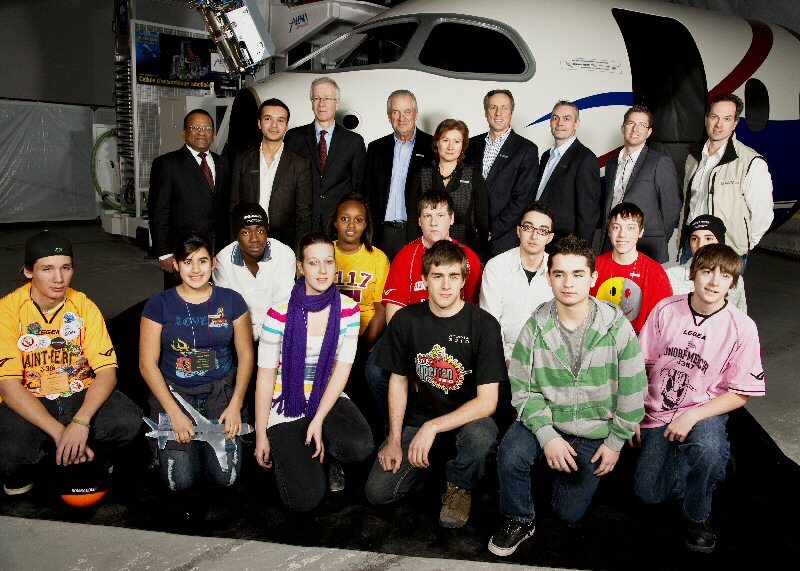 The event was attended by Laurent Beaudoin, Chairman of the Board, Bombardier Inc. and of FIRST Robotics Québec; Guy C. Hachey, President and Chief Operating Officer, Bombardier Aerospace; Hugues Lessard, Vice President, St-Laurent Manufacturing Centre, Bombardier Aerospace; representatives from FIRST Robotics Québec and Youth Fusion and approximately 300 students from Québec who will be participating in this year's competition. "Bombardier's involvement with FIRST Robotics is a natural fit," said Mr. Beaudoin. "Both organizations bring teamwork and robotics together to create innovative products, as evidenced by the two new multiple-axis robots unveiled today that will be part of the manufacturing operations for the CSeries aircraft program. The support of FIRST Robotics Québec is also perfectly aligned with the Bombardier 3E approach, which focuses the company's community involvement on the areas of education, the environment and entrepreneurship." "I am very happy to be here in Saint-Laurent, where Bombardier's aerospace story began nearly 25 years ago," added Mr. Beaudoin. "Bombardier is proud to have the opportunity to introduce these students to our facility and host this kick-off event. It is our sincere hope that today's visit will foster an interest in the aerospace industry among these young people." Bombardier and the J. Armand Bombardier Foundation have been supporting FIRST Robotics since 2008, and many employees from Bombardier's Saint-Laurent Manufacturing Centre have become involved as mentors. The program provides an opportunity for employees to share their knowledge and passion with high-school students, and inspire them to remain committed to their education, whether in science and technology or in some other discipline. In December 1986, under the leadership of Mr. Beaudoin, then Chairman and Chief Executive Officer, Bombardier Inc., Bombardier took its first step into the aerospace industry. Today, the company has grown into the world's third largest civil aviation manufacturer, with a portfolio of innovative products and services for the business, commercial, specialized and amphibious aircraft markets. "Bombardier Aerospace has a rich history, one which has been made possible by the thousands of employees, both past and present, that have brought their expertise and ingenuity to legendary aircraft programs such as the Challenger and CRJ Series aircraft and game-changing products that will enter into service in the coming years, such as the Learjet 85, Global 7000, Global 8000 and CSeries aircraft," said Mr. Beaudoin. "As we begin celebrating our achievements from the past 25 years, we not only stand proud of our past, but also are confident in our long-term future." The original Canadair facility, known as the Saint-Laurent Manufacturing Centre, is home to more than 3,500 workers, and the state-of-the-art facility is currently the subject of a major transformation program that will prepare the site for the production of the cockpit and assembly of the aft fuselage for the all-new CSeries family of aircraft. The plant is at the heart of Bombardier Aerospace's worldwide operations, which span five countries and total more than 29,000 employees. Photos from today's event will be available in the press releases section at: www.bombardier.com. A video that presents milestones from Bombardier's history in the aerospace industry will be available for viewing as of 12:00 p.m. EST today at: http://www.youtube.com/bombardiervideos (French only). Bombardier, Challenger, CRJ, CSeries, Global 7000, Global 8000 and Learjet 85 are registered or unregistered trademarks of Bombardier Inc. or its subsidiaries. Alan DeSousa, Mayor, Saint-Laurent Borough; Gabriel Bran Lopez, Executive Director, Youth Fusion; Stéphane Dion, Member of Parliament, Saint-Laurent - Cartierville; Laurent Beaudoin, Chairman of the Board, Bombardier Inc.; Hélène V. Gagnon, Vice President, Public Affairs, Communications and Corporate Social Responsibility, Bombardier Aerospace; Guy C. Hachey, President and Chief Operating Officer, Bombardier Aerospace; Hugues Lessard, Vice President, Saint-Laurent Manufacturing Centre, Bombardier Aerospace; Xavier Guillot, Regional Director, FIRST Robotics Québec; and François Michaud, Université de Sherbrooke, along with a group of students from Québec who will be participating in the 2011 FIRST Robotics competition.